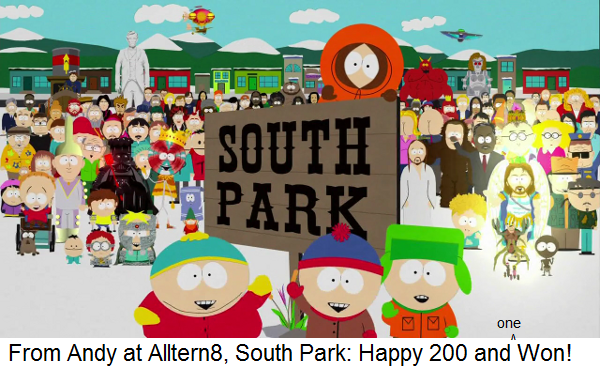 South Park – 200 And Won! 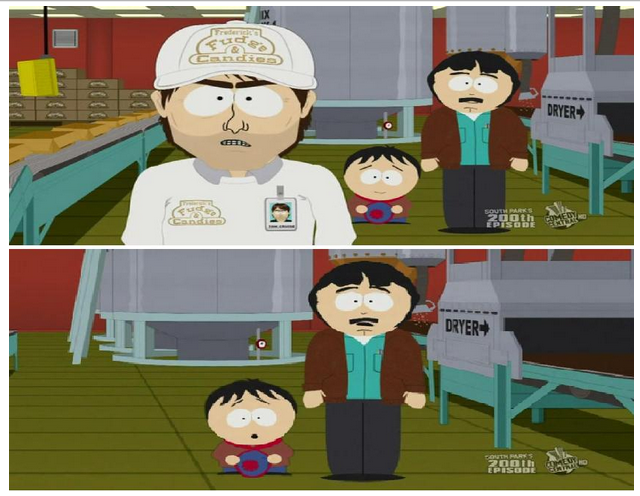 Critics hit on the notion early South Park had a quality of nonsense lost to the later infiltration of celebrity appearances and “messages”. I concede I’m a minority proudly of the view that early episodes were not very good. Furthermore, they were without direction. The motif of offending everyone looks stronger when not so crass, when plush Kenny dolls are not inserted into every artifice and orifice. The attack on celebrities by South Park celebrates powers of parody, and questions a society that, however uneven-handed, elected them. The Simpsons comes under less fire for it’s pandering employment of idiots, ad-men and war criminals. 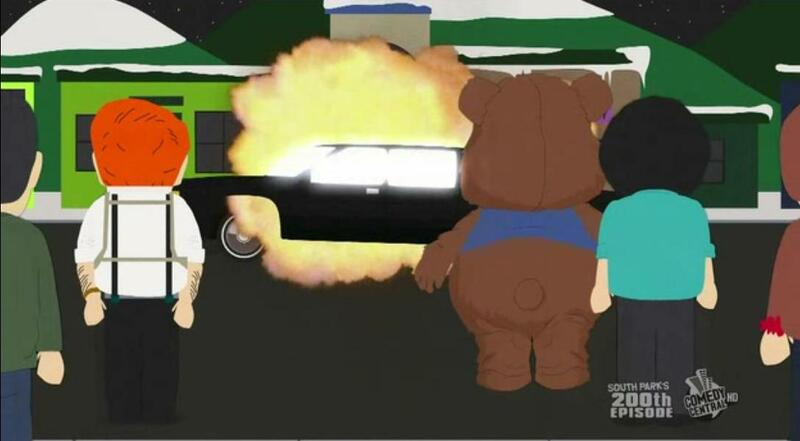 South Park is an act of communication: so why do Western brats whine about “messages”? Parker and Stone approach the milestone 200th gracefully, celebrating incarnations of the show along the spectrum. Beautifully self-referential, the newly offended Tom Cruise does what any melodramatic villian does. He assembles together other offended celebrities to launch a class action lawsuit against the town. Desperate to avoid destruction, they manage to cut a deal with Cruise: he has always wanted to meet the prophet Muhammad. From there to the Super Best Friends, a Justice League of Deities where Stan might enlist Muhammad’s help. Except that some Muslims have forbidden it, already parodied in the Park as a threat issued to the mediocre Family Guy staff. Other implications included a threat on Danish cartoonist Go’morgen Danmark and an auction house turning down Danmark’s efforts to help the victims of the Haitian earthquake. That, and stealing teddy bears and teachers from children. Between the airing of ‘200’ and ‘201’, Parker and Stone received death threats from Muslim extremist predictables. The decision spurred Comedy Central to censor ‘201’, bleeping out every pronunciation of Mohammad and (presumably by implication), the customary final speech which included not a mention of Mohammad. Growing up in Northern Ireland where people were murdered one another over for religion, I saw the hypnosis for enslavement to cover for trades of arms, property and drugs. For most of the people on this planet, we’re pissed off with Abu Talhah al Amrikee, Westboro Baptist Church and Tom Cruise. Worse, we’re embarassed. Then, it’s all a bit too tiresome really. 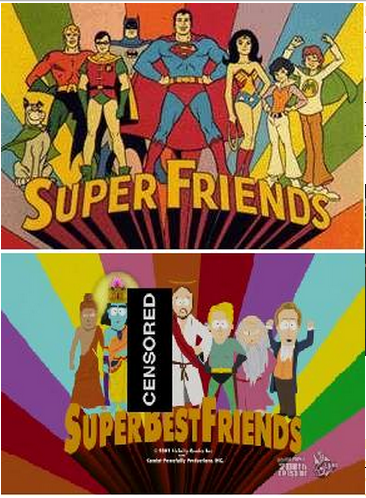 The censorship strips back the layer of visibility: the episode has little to do with Mohammad, or even the image of a representation of Mohammad. It’s about what can and can’t be shown in a clips episode. It doesn’t affect the creation of a piece of art which is most parts epic Hollywood blockbuster like Longer, Bigger and Uncut or Imaginationland. A homage to great superhero cartoons and comics and theatrical drama. It’s about making people laugh and engaging them with surprise and thorough Story. Less than three minutes into the Muslim censor-fest of ‘201’, this is made abundantly clear. The message is obviously about the power and bleeping. This was a bleeping great episode all the same. Parker and Stone anticipate many moves ahead with subtle kind gestures. Careful, entertaining and attuned. Some things hardly need to be communicated, but I’m going to go there anyway: It ain’t The Wire, but it remains one of the smartest shows on American television. Spoilers are censored. If you’re religious, maybe you can forgive me? South Park Online is currently not streaming ‘201’ presumably until the heat blows over. Or Mecha-Streisand calms down and forgets about the torrents.